Most of what has been written about St. Patriarch Tikhon since his repose on the Feast of Annunciation in 1925, has centered on the short years of his patriarchate. Although this coincided with the most complex and difficult time in all of Russian Church history, all who take up the pen in his regard agree that he was the “right” man, chosen by God, for that critical hour. Indeed, his experience on this continent contributed no small measure towards the rational and balanced way he had of thinking, and of dealing with events that would have overwhelmed a lesser man. At the same time, it was precisely during his American sojourn–an elementary stage in American Orthodoxy – that a whole “tone” was set, and a direction given, to the Faith on this continent. As a true Christian missionary, however, it was not the building of temples that concerned Saint Tikhon primarily, but the building up of the Faith in temples not made with hands–human souls. To this end he made frequent tours of his vast diocese–Alaska, the U.S. and Canada, undaunted by the physical hardships which traveling often presented. Details have been preserved by those who shared in these trips. “To the gifts already received by your church from the Heavenly King and from the earthly Tsar, in recent days there was added the gift of the transferred Diocesan Cathedral into your city and into your church. This is given to you according to your ability. Your city is the second in the world and the first in this country. All the nations are represented here. And how many churches of different traditions are found here! Why not also have the representation of the true Orthodox Church?.,.But.,you should take care that this gift is not wasted, or buried, but that it bring profit to your church life and to yourselves.” This was a theme the Saint sounded repeatedly in America. Within two months Archbishop Tikhon left the metropolis, braving blizzards and snow drifts so that he could consecrate a new church in what remained of America’s “wild west’–Montana. The number of his parishes had grown from 15 to 70–all of them self-supporting–and there were also two seminaries, one in Minnesota and the other in Pennsylvania. (St. Tikhon’s, in South Canaan, still functions as both a monastery and seminary.) The Archbishop particularly wanted to train American clergy so that his parishes would no longer be dependent upon Russia for priests. Through his efforts a seminary was also founded in Alaska. There, too, he was active in opening a school for women, with an affiliated orphanage. Soon Archbishop Tikhon was back in his homeland, where events of cataclysmic proportions were about to erupt, and where his Golgotha-and his glory-awaited him. But in America his voice continued to echo with a missionary fervor the Church most still heed today. O HOLY PATRIACH TIKHON, PRAY TO GOD FOR US! Orthodox Life, No. 3, 1981. 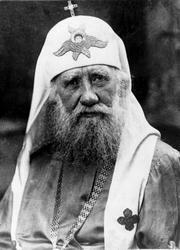 A Biography of Patriarch Tikhon, by Jane Swan. The Cathedral of St. Nicholas is today under the Exarch of the Moscow Patriarchate. This little parish church, Holy Transfiguration, still stands In Globeville, a suburb of downtown Denver, and is literally the “mother church of the half dozen or so Orthodox parishes in greater Denver Originally all Orthodox Christians, of whatever ethnic origin, belonged to this parish. Only many years later were other parishes formed along more strictly ethnic and jurisdictional lines. At present this parish is part of the “Orthodox Church of America” (OCA) For more about the missionary activities of Fr. Alexey Toth, see the latest issue of Orthodox Life (May/June. 1989).